I don't love burgers but those actually look really good and tasty! I enjoy a veggie burger or a regular one once in a while if we're at a friend's BBQ - it seems like a fun summer food, but that's about it! wow - those burgers look amazing! I love a good burger, but I also love good veggie burgers, so I'm good either way. We do Bocca burgers when we want a "hamburger." We love them though, and doctor them up with lettuce, tomatoes, mustard, ketchup, onions, etc. I make homemade fries with them and the kids all think it's the best treat ever! Ortega chilis and pepper jack cheese! The only time we go to a burger place is Red Robin (at my girls request). I get the lettuce-wrapped veggie burger w/ lettuce, tomatoes, sauteed onions, guac and mustard. 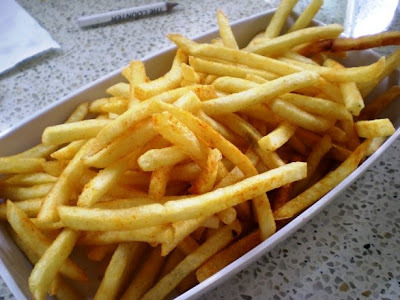 We all split an order of fries. Wow...those are some stuffed burgers!!! I like a good burger occasionally. It doesn't matter if it's a veggie or meat kind. I guess it depends on the mood I'm in. But as long as there's cheese on it,, I'll be happy. although I'm not a big fan of burger... I like to have it from time to time. My favorite would be turkey, a juicy turkey burger or veggie burger with toasted bread, mustard and veggie! 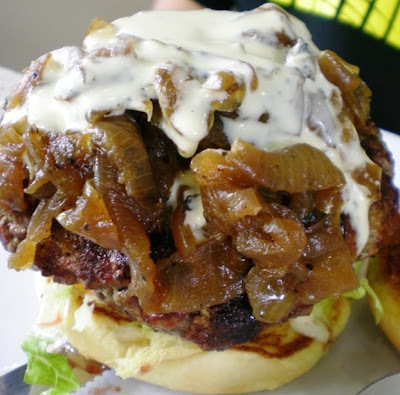 OMG, I love everything about the teenagers burger - except without the onions! I love combining flavors - but always spicy with jalapenos! the teen's burger looks RIDICULOUS! i don't really eat much red meat, but once in awhile, the craving comes and that looks like it would totally satisfy! definitely more and more! Look heavenly delicious! Wow those look like some amazing burgers! There is a place here in Columbus called Thurman Cafe and they are well known, even on the Food Network, for their ENORMOUS and delicious burgers! Nick and I go there maybe twice a year and I always get a burger, medium rare, with swiss and mushrooms. Oh it's so good. whoa! i now have an uncanny craving for red meat. i love my burgers with blue cheese, bacon and mushrooms! I am a burger nut!! I absolutely love beef of any variety :) But burgers? I'm an addict. I love mine on the grilled, medium rare, with lots of seasoning. I don't really put anything on them, occasionally katsup and pickles... but that's it. I've not been a meat eater for almost 3 years now but I did use to love me a good burger! Homemade veggie burgers are my fav these days - black beans, garlic, some veggies - with good bread and a bunch of veggie toppings, especially pickles - TOTAL YUM! 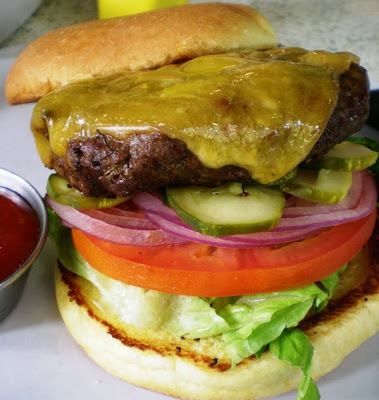 I'm not usually a burger person, Andrea- but those photos are making me drool!! My favorite burger, as mentioned in my last post, is the turkey burger with feta and aioli, mmm! I also love veggie burgers and chicken burgers. Sometimes I eat a little bit of beef burger when I have to (nothing else to eat), but it's just meh. I love burgers! Veggie and sometimes turkey with all sorts of toppings like lettuce, onion, cheese, hot sauce, pickles, hot peppers etc. Yum I love to pile them high! i love all types of burgers! veggie, black bean, beef, turkey, etc. I don't like most burger buns though!! I always eat the patties plain!